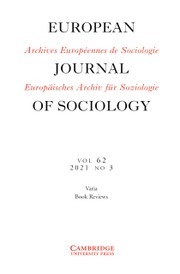 The European Journal of Sociology publishes innovative, empirical and theoretical research articles from every field of sociology. It is open to sociologically informed contributions from anthropologists, economists, historians, lawyers and political scientists. The journal has a special reputation for comparative and historical sociology but is not limited to these fields. It is methodologically open to qualitative and quantitative research. The journal aims to contribute to the diffusion of sociological research from European countries and to enhance interaction between European and non-European sociology.